The Molopolo, Sta. 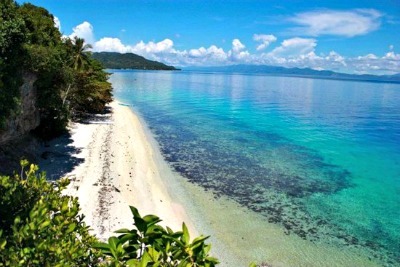 Cruz Fish Sanctuary in Macrohon, Southern Leyte is the perfect getaway for tourists from the hassles of life. Hailed as the 3rd best protected area in the country, there is no doubt that the tourist haven has a lot to offer. First is the gratifying welcome of the locals to the guests - the dancing of the traditional Curacha, the resounding hymn of folk songs and the skilled tour guides and ushers who serve as historian of the day. Then, following its slogan, “Lakaw, Tan-aw, Tilaw,” the guests will experience more of the place through the different activities prepared by the Marine Park Management Council. Lakaw means walk where tourists experience a 50-meter hike to save Mother Nature. The management prepared sprouted mangroves for every visitor to plant while walking. In tan-aw or see, the guests will be able to spot different kinds of fish like spotted cat (Ketong), tang (Banggisan), and mangrove snapper during fish viewing. Visitors can also feed a school of fish during the duration of the activity. The site also features boat joy-riding for only PHP50 per passenger where one would be able to enjoy the bounty of nature beneath the marine park without getting wet. For just about a 30-minute ride in a particular boating area, riders will get pleasure from sightseeing around the designated 10 stations, each depicting a sole attraction of the rich flora and fauna in the marine park. With the close supervision of the local diver, the place also offers activities for snorkelers and scuba divers. For tilaw, which means to taste, the guests will savor the mouth-watering delicacies of the place. They will be guided by an experienced maker in making the famous delicacy. Aside from the various activities that the park offers, it has been recognized by different government agencies. The place was awarded as the Best Practices’ Gawad Pamana ng Lahi from Department of the Interior and Local Government, Marine Protected Area Award of Excellence 2012 and Best Innovations National Award from the Commission of Population.